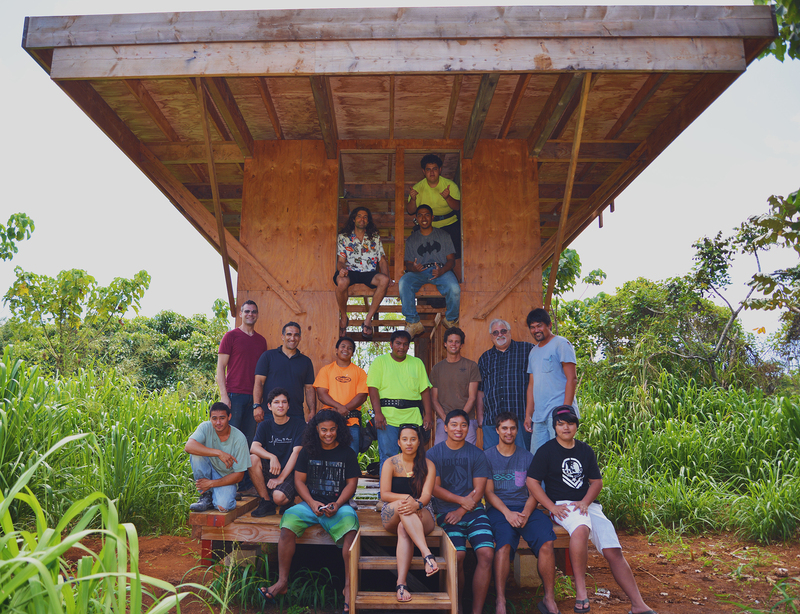 During the Summer of 2016 a free Tiny House building course was offered free to the community of Kauai. The course ran for five days and focused on building the floor, walls, and roof framing for a 10x12 foot tiny house. The materials to begin this project were gifted by a private donor and the KCC Carpentry Instructors volunteered their time to offer the class and begin the framework for the Tiny House. 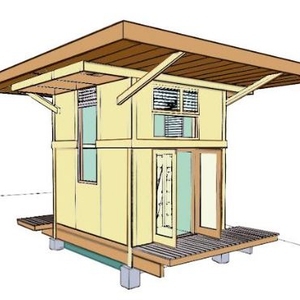 The tiny house project was developed near the campus hydroelectric site which utilizes a sugar plantation irrigation ditch. Our micro grid incorporates cutting edge renewable energy production, storage, and distribution systems. 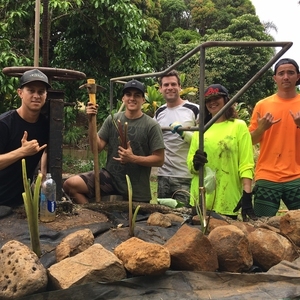 The concept for this project was a collaborative efforts of sustainability minded volunteers from the County of Kauai, Kauai Community College, and construction industry professionals. Our initial goal was to complete building a small single family prototype structures that demonstrates the viability of a complete set of solutions in addressing both affordability and sustainability. We hope to advance the discussion locally on how to remove barriers to more sustainable building design and construction. We feel that it is imperative to provide both written/academic/policy discussions and research as well as immediately visible, applied research and experimentation in housing prototypes in order to explore more impactful solutions. -Create visible examples of affordable sustainable living that aggressively address both cost constraints and sustainability. -Always acknowledge that the proposed solutions are just examples of the many ways that these challenges can be addressed and that the intent of the work is to increase awareness, advance the state of local knowledge, and explore means of addressing barriers to the use of the materials and systems proposed. -Attempt to keep systems simple and avoid proprietary solutions when possible -Attempt to design structures in a way that is easily replicated by people with basic skills -Acknowledge where current regulatory/policy barriers exist with proposed systems and design solutions in a way that attempts to address concerns & enable a conversation on what is possible -Design structures that are semi-portable/modular for efficient assembly and can be transported without specialized equipment or large trucks, etc -Learn by doing, fail forward, make learning and improvement the highest priority of the projects undertaken. 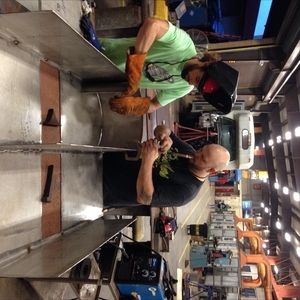 The project was implemented through the collaborative and volunteer efforts of sustainability minded volunteers from the County of Kauai, Kauai Community College Faculty and Students, local construction industry professionals, and private donors. Design decisions were made as a group effort and built upon and modified over time. Instructional planning and implementation were coordinated by Kauai Community College's Faculty. The project was funded through a network of private donors with the assistance of the University of Hawaii Donor Foundation. Spring 2016 - Initial Project Funding was secured. 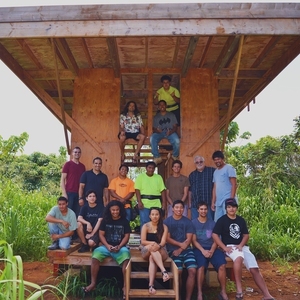 Summer of 2016 - a free Tiny House building course was offered free to the community of Kauai to build the initial framing components of the tiny house. Fall 2016 - Additional funding was secured to complete the tiny house and integrate a hydro electric micro grid system to power the house. -Hydro electric station water delivery systems and infrastructure upgrades were completed. Spring 2017 - Tiny house foundation, site work, and rough framing was completed. -Electical infrastructure for turbine energy management implemented. Summer 2017 Goals - Order components and complete micro grid design. Complete design and order materials for composting toilet. Complete design and installation of garden roof. Fall 2017 Goals - Complete micro grid installation and testing. Complete finish work on tiny house. Update project website and implement community outreach and public awareness of the issues that tie into the project. The project was initiated by a $7000 donation from a private donor to begin the tiny house rough framing. The addtional cost to expand and complete the project were approved by the University of Hawaii Donor Foundation. Successfully producted, stored, and utilized hydro electricity on campus. Tiny house infrastructure is in place and ready for completion in Fall 2017. Collaboration between multiple disciplines of study and the community were a success. Project updates have been shared with the community in the news and local magazines. This campus project requires crossdisciplinary collaboration to complete. Using the hydro system and tiny house as project based learning for student in the Sustainable Science Management courses. Students responded very well to learning about concepts and technologies in a real life application.